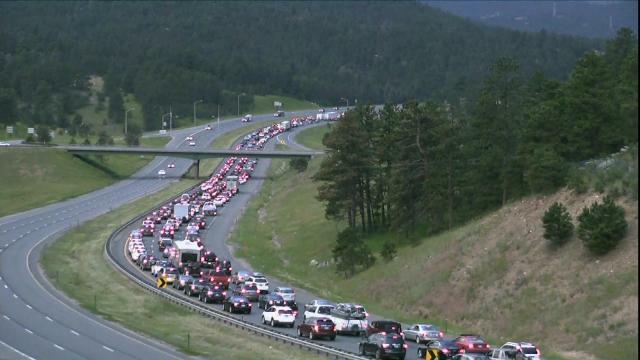 A traffic build-up can be expected, with up to one-hour delays, when traveling on I-70 near Idaho Springs early next week. Taking advantage of lower traffic volumes on the I-70 mountain corridor, the Colorado Department of Transportation will perform necessary rockfall scaling just west of Fall River Road near Idaho Springs to protect motorist safety. With intermittent traffic stops planned for next week, those traveling the corridor through Clear Creek County should plan on delays of up to one hour. This scaling work is in response to a rockfall that happened in early April. Crews are going back to this location to clear off and remove any remaining potential hazards. From 9 a.m. to 5 p.m. Sept. 12 and 13, motorists can expect 20-minute traffic holds in both directions of I-70 between mile posts 234 and 238 as crews remove rock debris by pry bars and airbags. A full closure of east and westbound I-70 is necessary to protect motorists from falling rock and debris. From 9 a.m. to 5 p.m. Sept. 14, motorists can expect a single right lane closure so crews can haul the rock debris off the site to restore the ditch capacity to pre-rockfall conditions, which will help mitigate any potential rockfalls in the future. Crews will closely monitor traffic queues during the full closures and will temporarily stop work to let traffic through if the line of vehicles stretches past three miles. Once traffic is flowing normally, crews will conduct another traffic hold. Motorists should be advised that there will be a delay once crews open this area as vehicles reach posted speeds. For information on I-70 travel conditions, visit COTrip.org, download the CDOT Mobile app, sign up for GovDelivery or call 511. Updates are also available via Twitter @coloradodot and CDOT’s Facebook page at Facebook.com/coloradodot.